The goal of the ASC standards is to provide a means to measurably improve the environmental and social performance of aquaculture operations. To that end, each farm standard undergoes a periodic review (every 3 to 5 years) to ensure effectiveness, based on latest knowledge and best practices. During the most recent Review period, it was determined that improvements would be made to the standards for salmon, pangasius, freshwater trout and shrimp. These are not full reviews of the standards, but rather reviews focused on areas where effectiveness is not as was anticipated during the Aquaculture Dialogues, and/or which don’t deliver on the intent set out in ASC’s Theory of Change. 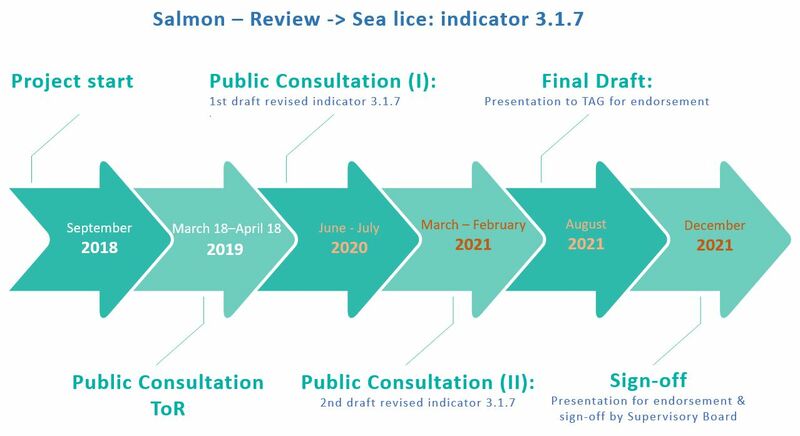 ASC has on March 18, 2019, published the Terms of Reference (ToR) for the review and revision of the Salmon Standard v1.2’s indicator 3.1.7; which deals, in areas of wild salmonids, with the “maximum on-farm lice levels during sensitive periods for wild fish”. This review and revision process adheres to the ASC Standard Setting protocol, which means amongst others that the ToR, the first draft and the second draft of the proposed revisions will be put up for public consultation. The ToR is up for public consultation for a one-month period (March 18 – April 18, 2019). Please consult the ToR for more information about the revision and process. As full ISEAL Alliance member, ASC is required to review, and revise where needed, each standard every 3-5 years. The main objectives of Standard’s review are to assure that the standards’ metric indicator is set at an accurate level and that this level is substantiated through public data (during consultation & after completion).